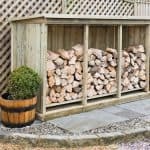 Log stores are very useful things, enabling the owner to make the most out of their log fire, log burning stove, or chiminea. Not all log burning stoves are the same, however, as we were reminded upon seeing this very stylish and well built alpine log store. It features two compartments that are arranged in triangular fashion. The large compartment is ideal for logs while the smaller upper compartment can be used for kindling. The result of this is that it has a large overall capacity, and extra flexibility. 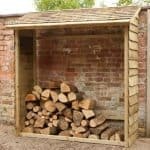 This log store offers much greater weather protection for its contents than many of the log stores we see. That’s because it has solid shiplap sides that cause rain to simply bounce or run away. 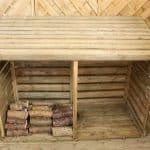 The front is open, in classic log store style, and this allows ventilation to reach the logs and dry them out. The store’s back has a slatted design, although this can be negated by placing it against a wall. We were very pleased to see that all the timbers had been pressure treated, as this gives them long lasting and reliable protection against rot. The effectiveness of this is shown by the 15 year guarantee provided by the manufacturer. The first thing that struck us about this log store was its design. It’s been built with aesthetic appeal in mind as well as functionality, and we feel it certainly achieves that thanks to its prismatic styling. We also like the segregated compartment for kindling, which gives the added convenience of having everything needed in one place. We were initially concerned that because it tapers to a point, it would lack storage space when compared to the more traditional rectangular log stores that we often see, but thanks to its generous dimensions this wasn’t the case. The overall width is 1.52m and the overall depth is 0.61m, but it rises to a ridge height of 1.87m. We were pleased to see that shiplap cladding had been used on the walls, as this offers excellent protection against driving rain. With a thickness of 12mm, it’s thinner than we see on some of the leg stores review. It is, however, allied to a heavy duty 45 X 45mm frame, which gives it noticeable strength and stability. 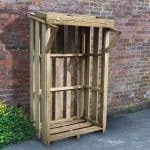 Whether standing alone, or positioned next to a wall or shed, we feel that this will be more than able to withstand windy conditions. It was good to see that the floor, which is made of solid board material, had been raised above ground level by means of integrated floor joists. We don’t always find this on log stores, although it plays a vital role in ensuring that timbers are protected from ground moisture and therefore from the rot problems it can bring. The open front and the slatted back play an important role in allowing air to dry the logs naturally, in readiness for them being used as fuel. 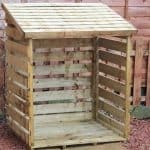 It can also of course, allow rain to get to them during inclement weather, so we recommend having a cover to place over the store, or positioning it next to a larger structure which can then help to protect the logs from rain. 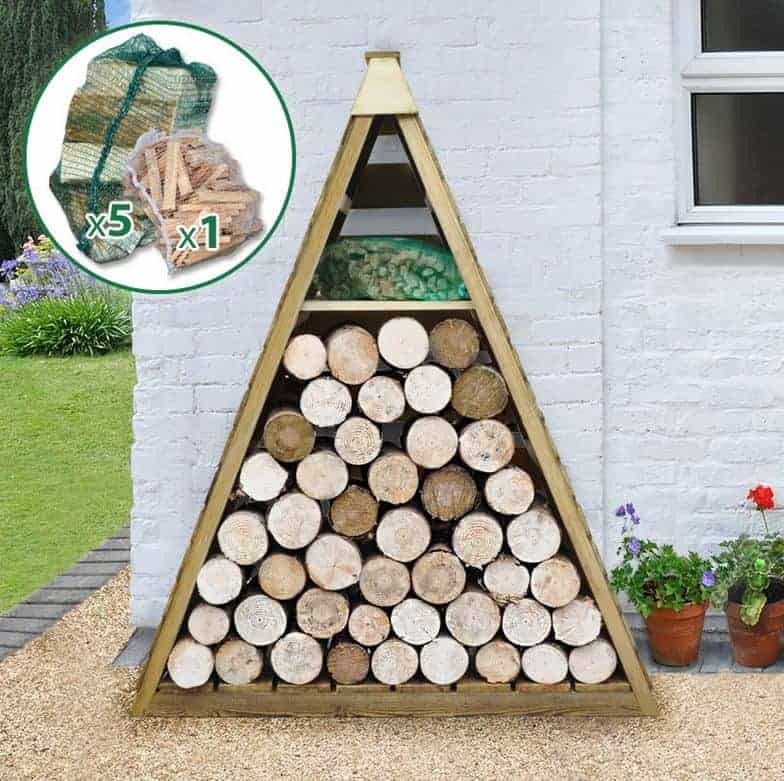 Taking either of these precautions will not only help to keep the logs dry and ready for use, it will also extend the durability of the store itself by helping to prevent the conditions that can lead to rot. Like all timber that’s going to stand outside in all weathers, a good quality treatment with wood preserver is essential. That’s why we were pleased to see that all the timbers had been given a pressure treatment to force wood preserver into their fibres, giving a very long lasting rot defence. The mark of how effective this is, is shown by the long and reassuring 15 year warranty supplied by the manufacturer. They also stipulate that there is no need for the owner to retreat the log store, meaning that once it’s up the work is done. We would still recommend that it’s checked every year, however, especially as it won’t take long to add a further coat of wood preserver. We also feel that it makes sense to paint the timbers with a good quality exterior paint or stain, as that protects them from the potentially damaging effects of the sun. 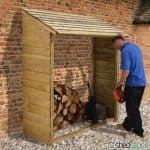 We were glad to see that some relevant and very useful optional extras are available to purchase with this log store. Foremost among them is a wooden saw horse, which makes it very easy to cut logs of any shape down to size. 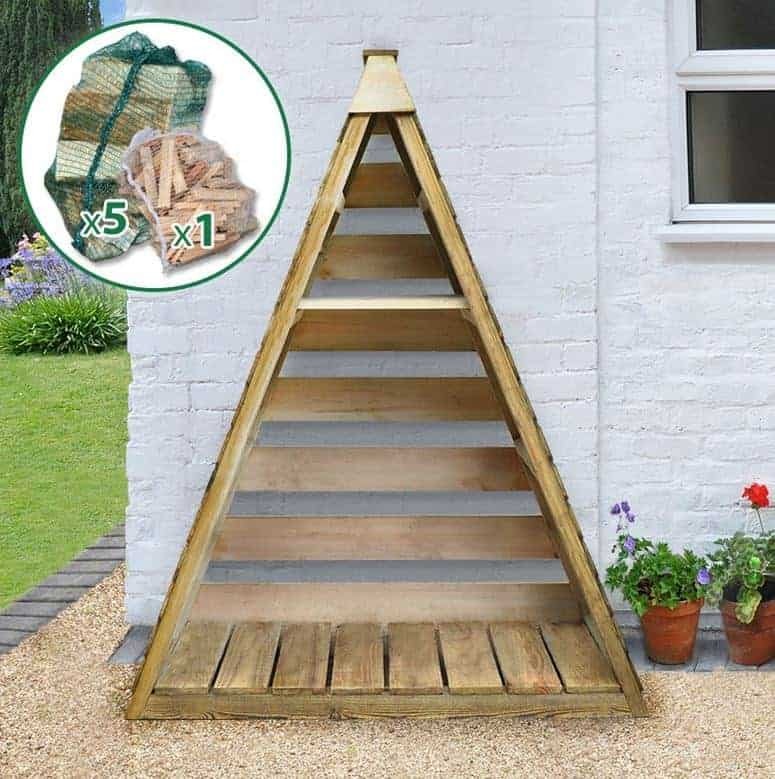 We also like the Store-Plus log gobbler, which at a price of less than ten pounds, is a good way to carry logs safely and securely using just one hand. Also available at less than ten pounds is a weed control membrane. 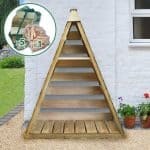 This can simply be placed onto the ground before the log store, and it effectively prevents weeds from re-growing in that area. This is a very well manufactured log store, and the attention paid to quality is shown by the use of pressure treated timbers across its entirety. It’s also a store that looks as good as it performs. Thanks to its initial pressure treatment, this is a structure that should last and last. It’s also very tough and durable, helped in part by its heavy duty frame. The triangular styling inevitably means that some storage capacity is lost when compared to a rectangular store, but we were still impressed by how many logs could fit inside the main compartment. 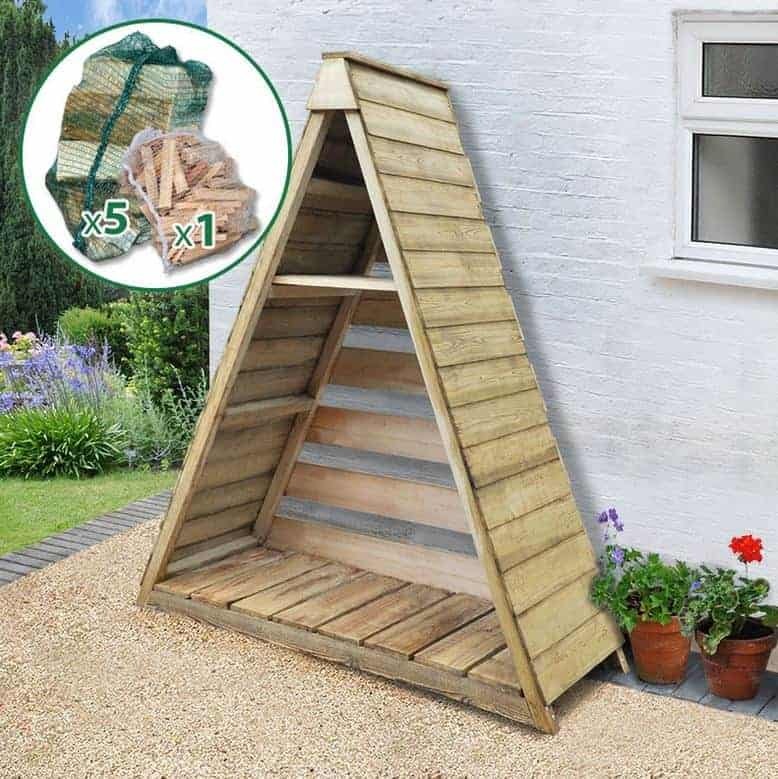 The unique design means that this can take a little longer to assemble than some log stores, but you should still expect to complete the installation in around two to three hours. We’ve seen log stores with a similar capacity available for less than a hundred points, but they don’t possess the good looks and finesse of this model. 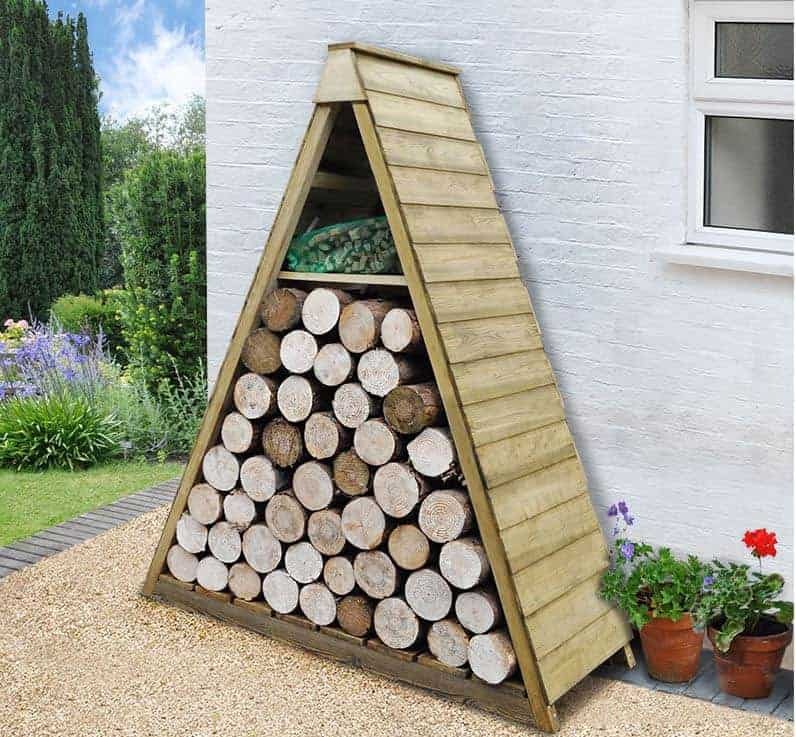 Final Thoughts: If you take great pride in the appearance of everything in your garden then you’re sure to appreciate the good looks of this log store. It’s not only there to fulfill an important function, it can also become a feature in its own right and a talking point in its own right. We’ve not seen a store of this size that has a separate kindling compartment before, and we think it’s a nice addition. You’ll never again have to worry about how to dry out the wood you’ve collected as kindling, or where to keep it. We also expect this to be a very long lasting log store, and it’s obvious the manufacturers do as well which is why they’ve provided a warranty as long as any we see on this kind of structure.